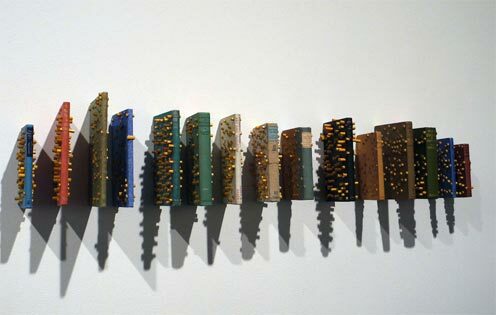 Paul Cullen Models, Methods and Assumptions 2012 books, pencils, paint and resin. a vocabulary of dismantled and altered objects (chairs, tables, pencils…). 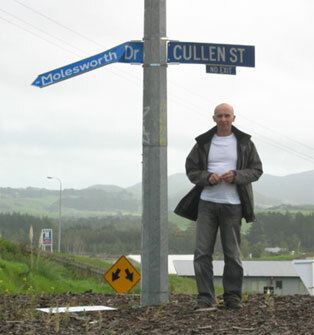 Paul Cullen was born in Te Awamutu in 1949. In 1971 he graduated with a BSc from the University of Auckland. He went on to study at Ilam School of Fine Arts, Canterbury University, Christchurch where he obtained a Diploma of Fine Arts (Honours in Sculpture). In 2000 he completed a MFA (1st Class Hons) at the University of Auckland and obtained his Doctorate of Fine Arts in 2007. He held his first solo exhibition in 1975 at the Centre Gallery, Christchurch then went on to exhibit in both solo and group exhibitions nationally and internationally. 2017 - Things from Geology (Underworld) Headland, Sculpture on the Gulf, Waiheke Island. 2017 - Provisional Arrangements Two Rooms, Auckland. 2012 - Made Active - The Chartwell Show, group exhibition, Auckland Art Gallery. 2011 - A Diagram Headlands Waiheke Island. 2010 - Revolutions Per Minute Auckland. 2009/10 - A Garden Level 6 Sculpture Terrace, Te Papa Tongarewa, Museum of New Zealand, Wellington. 2009 - Weather Stations Headlands Waiheke Island. 2009 - Situations Peloton Gallery, Sydney. 2008 - Models, Methods & Assumptions Peloton Gallery, Sydney. 2007 - Falsework Dunedin Public Art Gallery. 2007 - Stockholm Falsework HAP Projects Stockholm, Sweden. 2006 - The Orange Theory te tuhi Pakuranga, Auckland. 2005 - Meeting Roland Barthes Signal Gallery, Hamilton. 2005 - Small Sculptures 64zero3 Gallery, Christchurch. 2005 - Second Problem (installation). Blue Oyster Gallery Dunedin. 2004 - Proposal for an unrelated site Christchurch Art Gallery. 2004 - Remember NZ at the 26th Sao Paulo Bienal, Brazil. Curator Tobias Berger. 2004 - Nine Dragons the International Environmental Art Symposium, Chung-Buk, Korea. 2003 - Inn-House – on the fringe of heaven group exhibition, Lopdell House Gallery, Waitakere City. 2003 - Nine Dragons International Environmental Art Symposium, Chung-Buk, Korea. 1999 - Box Project a touring exhibition at the Angel Row Gallery, Nottingham, Turnpike Gallery Manchester, and the Museum of Installation, London. 1996 - Star Projects Vrieshuis Amerika, Amsterdam, and Discovery of Oxygen, at Artspace, Auckland. 1993 - Science (inconclusive evidence)- Installation, Centre for Contemporary Art, Hamilton. 1987 - Sub(urban) an installation, Wellington City Art Gallery. 1986 - Aspects of Recent New Zealand Art: Sculpture 1 at the Auckland City Art Gallery. 1978 - Mildura Sculpture Triennial Victoria, Australia. In 1975 Cullen was selected for the first Hansells Sculpture Awards. Throughout his career he would be a finalist in many major national art awards and as a recipient of grants from both the Arts Council and the Goethe Institut he was able to travel and research sculpture overseas. In 1996 he traveled to Avize, France to undertake a Moet et Chandon Artist fellowship. In 2002 a MIT Research grant enabled him to attend Documenta 11 in Kassel and Manifesta 4 in Frankfurt am Main, Germany. He participated in various outdoor sculpture projects including: 1999 Sculpture in the Gardens an exhibition of temporary site-specific works in the Christchurch Botanical Gardens curated by the Robert McDougall Art Gallery; 1999 Passage commission for St Peter’s College, Auckland, chapel site. In 2003 Cullen was selected to take part in the first Sculpture on the Gulf,held on Waiheke Island and took part in the 2009 and 2017 Headlands exhibition. In 2006 Dilana Rugs invited Cullen to design for their handmade limited edition range; the resulting rugs have been exhibited in France and featured in major interior design focus magazines. 2012 he received a Senior Fulbright and was based at the Architecture Department at Auburn University in Alabama where he worked with landscape architects to develop a site-based outdoor sculpture project. He also undertook research in experimental site-based art projects in various locations around the US including Los Angeles, New York, Chicago and Marfa. He returned to NZ via Germany for Documenta 13 and carried out further research in Munich and Berlin. He was a lecturer at Manukau Institute of Technology and then from 2008 at AUT where he became an Associate Professor and from 2014-2016 Head of Department of Visual Arts. He was also a Judge of the NZILA Biennial National Landscape Awards. Cullen is represented in major public and private collections nationally.